It's been sometime since I review Transformers Animated toy regardless the cartoon had ended. Given a choice between the Transformers Animated Toys and the new movies toy, I will choose the Animated version every other day and twice on Sunday. Movie version often lost it appeal to me over time. Moving on to the review Swindle, is a money minded Decepticon as a fire arms dealer that provide many destructive needs of the Decepticon. He is constantly selling something in the animated series. Apparently, Megatron was his biggest customer. 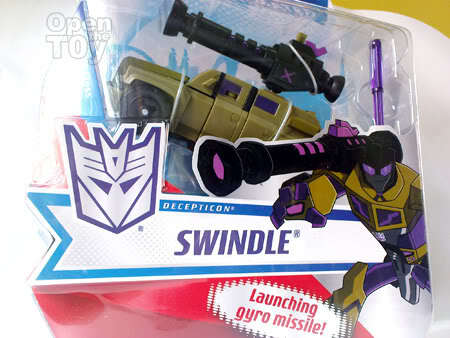 More information regarding Swindle can be found on the back of the card. 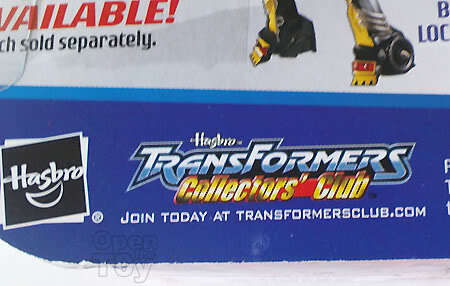 For the first time, I notice there actually have a Transformers Collectors' club from Hasbro. Hm... Maybe I should join them. Okay time to Open the Toy! 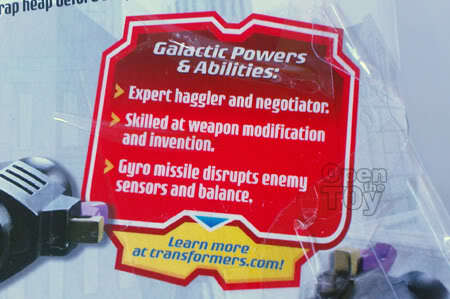 Out of the package, you will get a missile, missile launcher and Swindle in his armored Humvee-styled vehicle form. I just love the his color tone, the purple and dirty green. The vehicle design was an armored Humvee-styled vehicle with roof-mounted cannon. 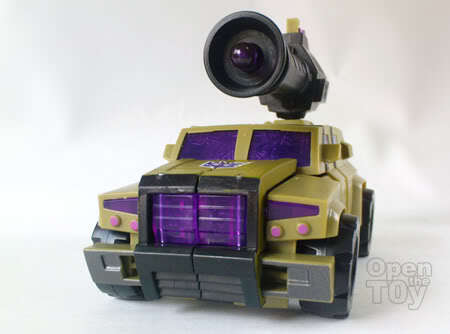 When the cannon is mounted on Swindle in vehicle mode, the cannon seems to be oversize. 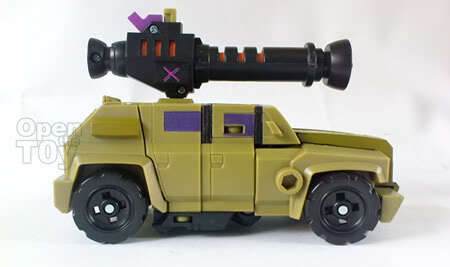 With the size of that "Scatter blaster", I wonder will Swindle suffer a recoil a upon fired. The Transformation was manageable with the help of the instruction sheet. Personally, I love the robot design of Swindle. The front and the back view show a proportion body but the side kind of make him look Flat. 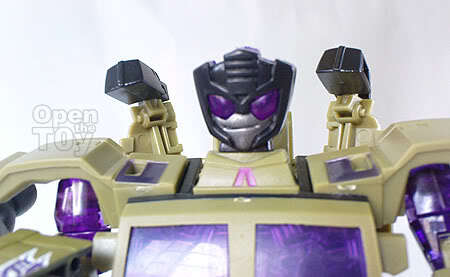 Swindle comes with a handsome looking face. Always smiling. You never know what he is thinking looking to his big purple eyes but I am pretty sure Money was always on his mind. His hands was unique in the toy series as his hands are made out of purple translucent plastic. Look real cool to me. Due to the fact he is an arms dealer, he is always loaded with lots of fire power. He got guns mounted on his shoulders and a chain gun that appear from his chest should he need extra fire power. In the animated series, he store his goods in a Transwarp-based hammerspace in his chest. His primary fire power remain on his Scatter Canon. A nice touch was put into the cannon toy. Before loading the cannon remain very much purple. But when the missile is loaded in, the Orange strips will appear. Load and ready to fire away. 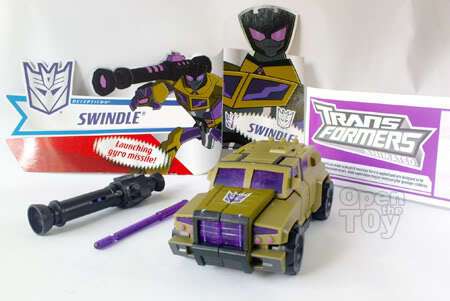 In short, the toy very much stay true to how I remember Swindle. 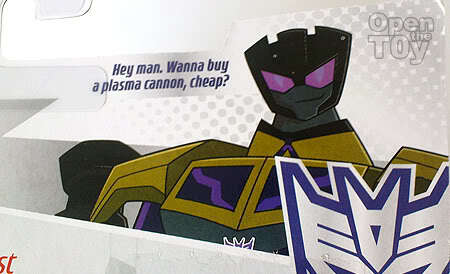 A smooth talking Decepticon who was always looking out to make a profit. That bring us to the end of the review. What? No comic strip after the review?But we always have comic strips after every review!!! Updated: Here is the comic Strip I promised. I agree the colour tone is nice. 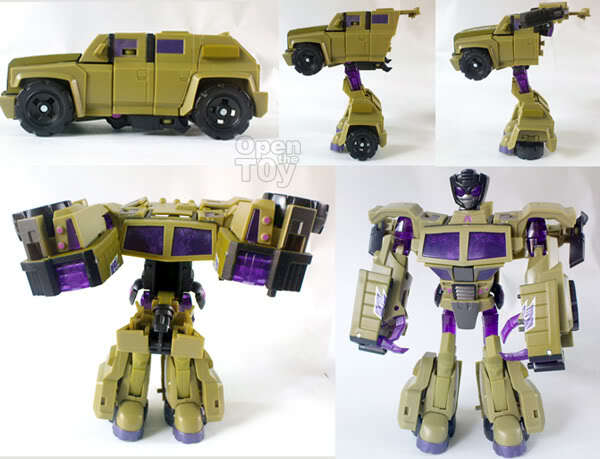 One thing great about TF Animated toys is that they are made very closely in appearance to the characters you see in the cartoons. Maybe Swindle can join the combaticons. Hee! Hee!